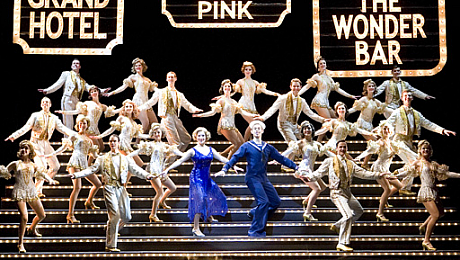 With top hats, sequined dresses and cocktails, 42nd Street certainly does capture the glamour and excitement of Broadway in the 1930’s. However, it also addresses the harsh reality of job uncertainty and money worries which faced many Americans during the Depression. The show bursts into life and introduces the audience to the leading lady, Dorothy Brock, (Marti Webb) who oozes sophistication and amazing vocals, along with her loveable partner, Abner Dillon, (Bruce Montague). Julian Marsh (Dave Willets), Maggie Jones (Carol Ball) and Bert Barry (Graham Hoadly), play the creative team of the show, Pretty Lady. 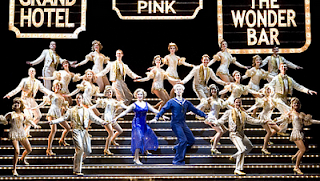 They work brilliantly together and inject some comical moments into 42nd Street, particularly during the audition scene. Jessica Punch captures the naivety and innocence of small town starlet, Peggie Sawyer, who ventures to New York to follow her dreams of performing in a Julian Marsh musical. After a shaky start, she proves her talent and, with a bit of persuasion, she takes on the leading role in Pretty Lady, where she effortlessly performs an array of tap dancing routines with such energy and comical facial expressions. During the opening night of Pretty Lady, Peggie and Billy Lawlor (James O’Connell) perform a graceful and enthralling tap sequence. Rebecca Marks also shone through as feisty Anytime Annie. The Lullaby of Broadway was the highlight and surprise of the show, with outstanding vocals from Julian who demonstrates a gentler side to his character; along with the whole cast who successfully manage to persuade Peggie to stay in New York. Due to the plot, the characters lack a bit of depth and background story, but it is clear that this musical is all about the dancing. The entire cast perform each sequence perfectly and fill the stage with excitement, energy and enthusiasm.